Before construction of the Tennessee Valley Authority flood control system, the region frequently experienced spring floods. One of the worst occurred in March 1917. Heavy rains and snow melt in east Tennessee and western North Carolina caused the Tennessee River to rise from Knoxville into Alabama. On March 5, Chattanooga River Bureau observer L.M. Pindell reported the river was at 39.3 feet and rising at about two-tenths of a foot per hour. He predicted an eventual rise to 45 feet (flood stage was 33 feet.) Areas wast of Missionary Ridge from 16th Street south were already underwater. Mayor Jesse Littleton called on 50 citizens to lead the emergency effort. They quickly formed committees, divided responsibilities and went to work. Police and firemen assisted those fleeing the flood. Associated Charities moved into the mayor's office. Schools, churches and empty buildings opened to house 200 families already displaced. Church committees organized to feed them. By nightfall, the city was nearly surrounded by rising water. Eight hundred families had relocated, using every available wagon, truck and boat. In accordance with segregation laws, Almira Steele opened the Steele Home for Colored Children to black refugees. Black schools were also opened. Ambulances moved the sick, including eight families with measles to hospitals. A woman gave birth as flood waters crept into her home. As families fled, they took both furniture and livestock. Police and firemen aided in the effort to save precious belongings. The basement of Orchard Knob School held the neighborhood chickens. One farmer drove his dairy herd up Missionary Ridge. The morning of March 6 brought freezing temperatures. The river was at 43.5 feet and rising. The predicted crest was 46.6 feet. City sewers backed up. Basements flooded. 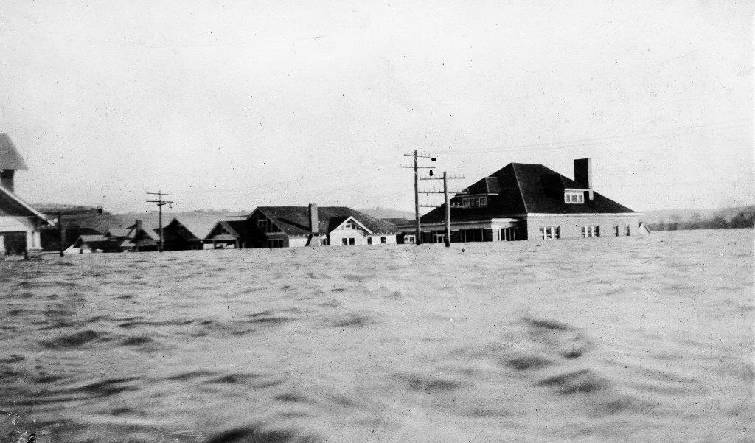 Over 50 percent of the city was flooded. The area from Main Street to the Georgia line was under water. Women cried as they left flooding homes. One woman saw her piano floating in her parlor as she and her husband rowed away. Some families were forced to evacuate twice. Those seeking refuge in schools moved to upper floors. Most citizens took the crisis in stride. The Orange Grove School housed a dozen families, along with their household items, pets and chickens. Churches sent food and bedding. The refugees fried bacon and shared a coffee pot. Preacher Tom Black decided to "get busy and have me a meeting tonight. The folks can't get away, they'll jest have to listen." Many people climbed Cameron Hill to view the devastation. Williams and Chattanooga Islands, as well as Moccasin Bend, were submerged in swirling, dirty, yellow water. Dead livestock and buildings floated by. Industrial areas south and west of the city were inundated. Ferger Place was the only dry spot south of Main. Warner Park and the baseball stadium were almost completely underwater. 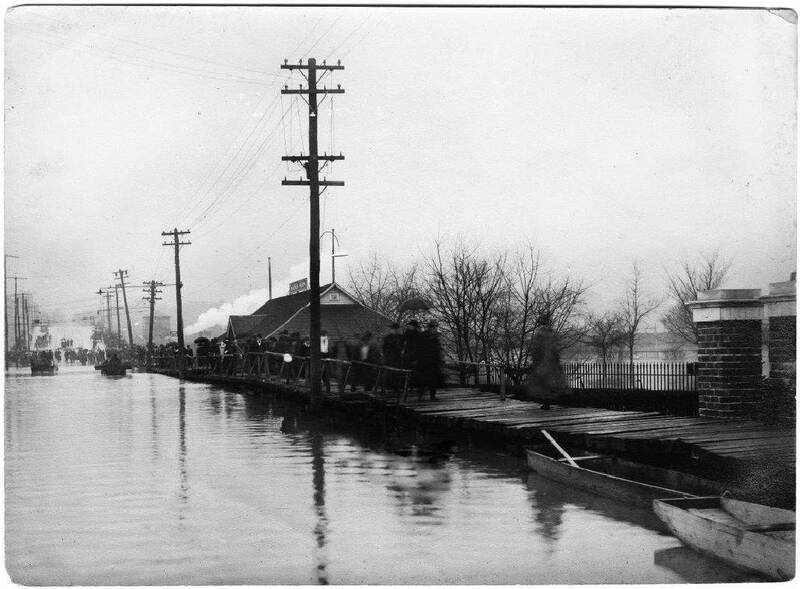 On the north side, the river climbed the high banks at the foot of the new Market Street Bridge. St. Elmo Mayor Findley Seagle ordered his lumber yard workers to make as many wagons as possible. Fearing the town would be cut off, Seagle arranged for a Southern Railway train to help with the evacuation. Though forbidding sightseers, street cars and trains continued to run. At 7 a.m. March 7, the river crested at 47.7 feet. By noon, the water began to recede. The city took three days to drain. Six thousand were homeless. Every public building held refugees. City Hall sheltered 575 people. Remarkably, there was no looting and only a few boat thefts. There was one fatality. Groups across the city helped during the crisis. Girls made sandwiches. Boys made flatboats. Boy Scouts helped the Humane Society rescue pets and livestock. Several boys in a skiff rescued six pigs. Merchants delivered food and coal, while other businesses offered vehicles of every description. A temporary hospital opened, as Erlanger filled to capacity. The Mizpah Congregation's Embroidery Circle made clothing. Elks Club members offered their services. The Chattanooga Times, the only official source of information, continued to print throughout the emergency. On March 8, the health committee began a thorough cleaning of the city and its suburbs. Damage was estimated at $300,000 ($6 million in today's dollars). During the height of the flood, a committee raised $25,000 for relief. Several weeks after the crisis, 74 committee members and volunteers calling themselves the "Stick-to-Its" met to turn in their police badges, rubber boots and slickers. Their job was finished. Gay Morgan Moore is the author of "Forest Hills Cemetery" and "St. Elmo." For more, visit Chatta.historicalassoc.org.